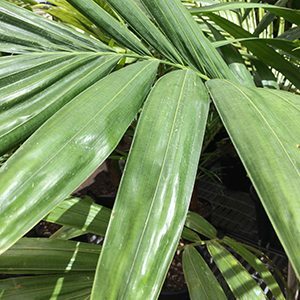 A fast growing palm from Queensland, Ptychosperma elegans is commonly called the ‘Solitaire Palm’. This is a palm tree that naturally grows in coastal rainforest areas and is an excellent palm tree for part shade. The trunk is slender and grey in colour, the crown shaft is a deep green, fronds are arching and open. In terms of cold tolerance, this is a palm tree that would find coastal Sydney gardens at its limit. This is a self cleaning and unarmed tree, often used in landscaping as an alternative to the Bangalow Palm, and as a small alternative to the Alexandra palm. The natural growth habit is with a single (solitary) trunk, however iy can be planted in groups of two or three depending in the effect required. Soil Humus – Well drained humus rich soils. Height – To 10 metres, usually less. Flowers – Small and green followed by red berries. Flowering period – Spring to summer. Growth Rate – Medium to fast.